What can geocoded results be used for? Many organizations manage records of information containing addresses of customers, locational coordinates, place-names, businesses, patients, or homeowners in databases. Converting the records into features that contain the location and spatial geometry is called geocoding and can be done using ArcGIS Pro. When you geocode a table of addresses, you use a locator to create point features that represent the locations of the addresses. The accuracy level of your geocoding operation is based on the input address information that is provided. From simple data analysis to business and customer management to distribution techniques, you can use geocoding for a wide range of applications. 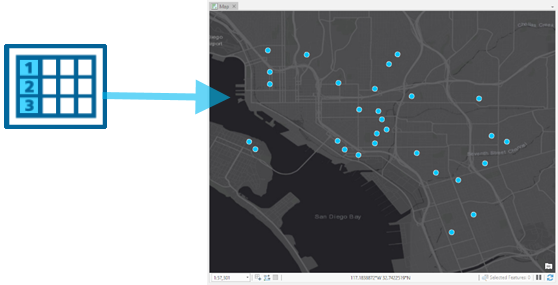 With geocoded addresses, you can spatially display the address locations and recognize patterns within the information. This can be done by reviewing the information or using some of the analysis tools available with ArcGIS. You can also display your address information based on certain parameters, allowing you to further analyze the information. Organizations maintain address information for their customers or clients. This can be in tabular format, containing the customer name, address, buying habits, and any other information that has been collected. Geocoding allows you to take your customers' information and create a map of their locations. Using a variety of related applications, you can use this information in many ways, from establishing marketing strategies to targeting specific clusters of customers to producing route maps and directions. The geocoded locations of your customers can be invaluable data.